Score another for team pie. According to the sort of people who predict such things, the dessert's supremacy will continue in 2011. While we sort of understood this past one to be the year of pie (a rare bright spot in an otherwise cruddy calendar year), experts like the editor of Everyday with Rachael Ray seem unwilling to give even that to 2010. "Pies are really coming back into style," she says, pointing out that even President Obama loves eating pie. 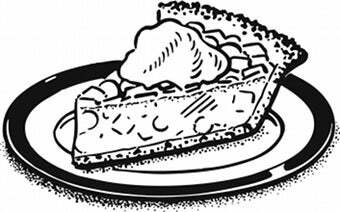 "We are seeing pies have their day in the sun because they are the ultimate comfort food. There is something so familiar about pie. In many ways, it can be a one-dish meal." Also big for 2011: fancy airport food and ritzy gourmet hot dogs. No mention of airline cuisine, but you can't have everything: in the spirit of looking ob the bright side, we'll endorse readily available pie and top-quality weiners for the next month. We're guessing you agree.